Lydden and Peterson located the Red Cliff group on Lydden Creek on the mountain, west of the forks of the Bear River and American Creek, and bonded the property shortly afterwards to “Coolgardie” Erskine Smith, who formed the Red Cliff Mining Co. Ltd and commenced operations. 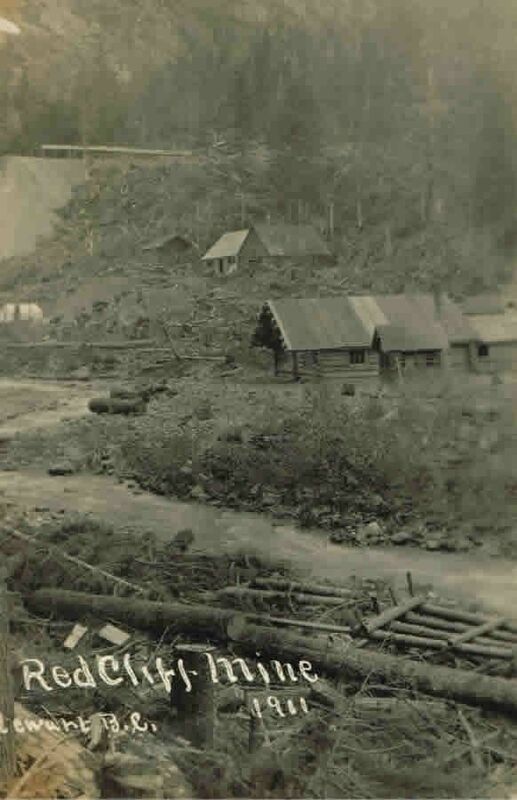 The ore showings being located on the steep mountainside, subject to snow slides, a tunnel of 1400 feet long was run from a safe position, where also, the main camp buildings were erected. The mine equipped with a ten-drill steam driven compressor plant and an electric light plant, which later were operated by water-power from Lydden Creek. Ore bunkers of 700-ton capacity were built beside the railway track, and connected to the upper bunkers by an 800-foot tramway, and 1200 tons of ore was shipped to the smelter. The value of the ore was never made public, but it was assumed that the results were disappointing as the work ceased shortly afterwards. One small shipment for a “smelter test” had been made from of the first ore opened up, which returned: gold: 0.25, silver: 2.44, copper: 8.25 percent. This was suppose to be representative of the ore that the mine would produce, but apparently was better than the actual “run of the mine” ore that was shipped. The mine was developed by four levels, 100 feet apart, and several thousand feet underground work done. Several ore bodies were opened up, the largest being one hundred feet in length and from 4 to 6 feet in width. Another ore body was 75 feet long and from 5 to 17 feet wide. The work on the mine was confined mainly to the development of these ore bodies and although several large outcroppings occurred on the property, very little work was done with them, although high values in gold were obtained. On the Montrose claim an exposure of ore occurs which is about 40 feet long and 5 feet high and from which some high values in gold were returned-in some cases over 5 ounces in gold, with, additional silver and copper values. “Coolgardie” had been an athlete and boxer of no mean ability in his time, but getting on in years when he operated the Red Cliff. One day in the mess house an argument took place as to how long it would take a man to walk on the newly completed railway track from Red Cliff to town. “Coolgardie” said he could do it in a certain time. What the time was has been forgotten, and bets were made that he could not do it, with another bet that a young fellow who was going to town would beat him on the walk. The pair started together and “Colgardie” arrived in town with a few minutes to spare and half an hour ahead of the young fellow.